I’m sure there will be people on both sides of the fence. I personally think one can err on either side of the issue, but the operative question for me is have we reached a point where the cart is pulling the horse? On a related note, should a corporation be treated like a person? Should there be more accountability to the communities that the business serves? How is that even possible when multinational corporations are involved and wield so much power to effect large populations? 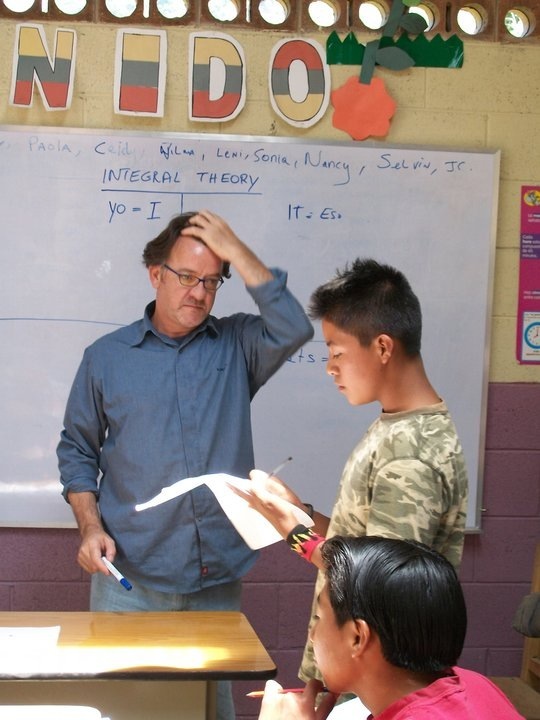 Last month, I went to Guatemala to visit the Integral Heart Foundation. It was my first time visiting Central America and I didn’t quite know what to expect. I imagined that the enormity of the poverty would shake me up, but my experience was that it didn’t. While there is a lot of poverty, I found that the indigenous population where I visited was on average as happy or more happy than the people in many developed parts of the world. They have a way of holding their economic situation in juxtaposition to some of the real riches they have – family, a sense of purpose, being close to the land, etc. On the whole, I liked the atmosphere. The most appropriate word I could put on it is “soulful.” Rather than having a white-washed quality, everything was in the open, both the best of the country and the worse. This is not to say that the poverty associated with Central America is in your face in tourist areas, but you don’t have to look far to touch upon both the warmth of the local people and the social injustice. Although I was a bit on edge at times, on the whole I found their was a “spacious” and “alive” quality about the place and the culture. Truly, Guatemala is one of the most physically beautiful places on earth. I also think some of the lack of formal education is offset by the common sense and simple wisdom of the native people. I found they carried themselves with dignity and an authenticity that is rare to find in the average American city. While I stayed and slept in a nice environment, the Porta Antigua hotel, I spent a fair amount of time visiting various villages, schools and areas of poverty. I thought that if I had this contrast, it would help me to better contemplate my experience and if I got sick from the water or contaminated food, at least I would be relatively comfortable. I also had some safety concerns, but that’s another story. My main purpose in visiting Guatemala was to visit the Integral Heart Foundation founded by Mick Quinn and Debra Prieto. I liked the idea of applying Integral Theory in a difficult social situation and it seemed like this broad approach had a lot of potential for being effective as it utilizes a multi-dimensional approach. Without going into a lot of theory, it focuses on individuals, their social situation, the beliefs of the culture and holistic tactics to deal with complex problems. In a more concrete fashion, I found that the Integral Heart Foundation really walked their talk and began with fundamentals such as providing education. This occurs at an early age as exemplified by their kindergarten program and continues on to high school. While academics are a big part of their work, the development of self-esteem, critical thinking skills and tapping into a person’s inner wealth through meditation and other practices is foremost from the inside glimpse I received. I also enjoyed seeing the results of the implementation of their solar program. In remote areas, there is no electricity so this puts a limit on how long kids can study. While candles are available, they cost money and families that make $8.00 per day or less are reluctant to burn there money in this way. 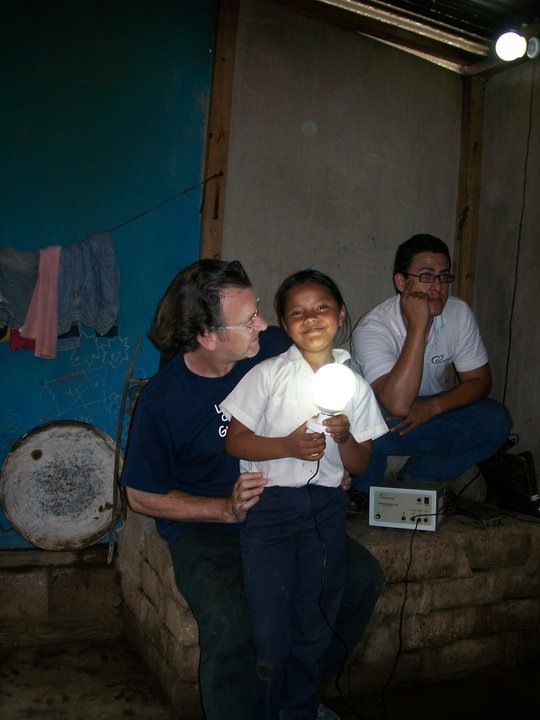 While we take light for granted, these people experience the availability of light as life transforming. This program goes hand-in-hand with education and other social work, which is performed on behalf of the families involved in any programs. Such basics as providing food is also part of the equation and therefore, it is easier to hold individual families accountable for their children’s attendance at school and other types of follow through that it takes to make the program effective. Below, you can see some examples of a kindergarten environment and also a high school setting. Here, Jen M. a volunteer appears with some of the youngsters. She came to Guatemala to support the work of the foundation and to share her big heart in person. While the Integral Heart Foundation has some great volunteers, they also need sponsorship, corporate volunteers and other sources of revenue. 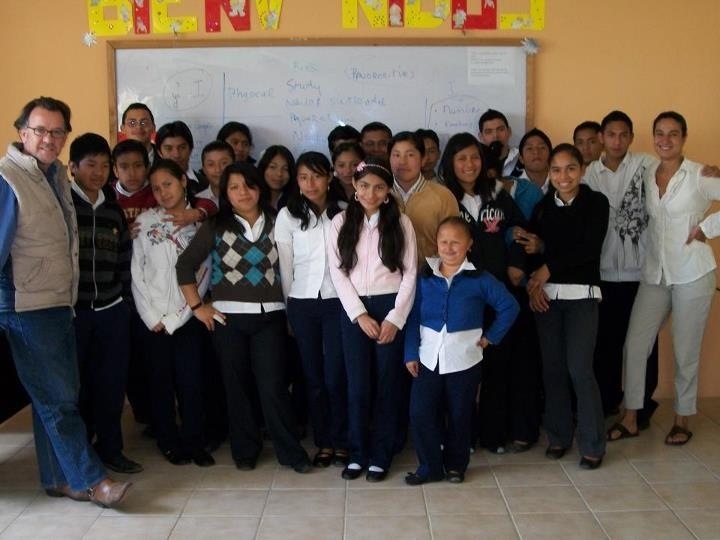 Now, they help over a hundred families on an operating budget of approximately $100,000. This is barely enough for a middle class family of four to live on in the San Francisco Bay Area. I also found that cooperation between organizations to share infrastructure was one way to lower costs and make the most of donation dollars. I toured one school that works with the Integral Heart Foundation where the infrastructure and environment was at least as good, if not better than some of the schools in San Francisco. I think this is because everyone chips in, people are committed to the outcomes and even the indigenous people who can volunteer in the kitchen, cleaning or whatever else needs to be done. I was also impressed that the high school had a garden, recycled water and was in essence a green environment. This is completely in alignment with many of the values of organizations in the Bay Area including various companies that develop, sell or distribute solar products. Wouldn’t teaming with this organization represent a win-win? Another area of commonality we have with this community is that we all consume coffee. Unfortunately, it is the coffee economy and historical complexities associated with it that causes a lot of the poverty and suffering in areas such as Guatemala. These are the people that the Integral Heart Foundation serves and their living conditions are not impressive. On average, a coffee worker in Guatemala makes as little as $3.00 a day and perhaps a bit more than twice this amount if they are in their prime. These low wages are one reason why people keep their kids out of school. The more hands there are to pick coffee beans, the more income a particular family can make. Above, Deb Prieto during a lighter moment and below, Mick Quinn perhaps in a more serious one. Philosophy, critical thinking and even Integral Theory are introduced at this level and therefore, some deep topics come up that help students related what they are doing to their social situation, fundamental place in the world and future. If you want to know about Integral Theory and how it can be applied, I have written several articles that appear on this blog and my other at http://patca63.wordpress.com/. You can also do a search on Amazon under Ken Wilber or read Mick Quinn’s excellent book the Uncommon Path, which although is not on Integral Theory proper complements and augments the concepts of this general approach. The former focuses on the high level perspective and the latter on individual mental health and responsibility. While I was visiting, I gave a talk to some of the high schools students and I found them to be polite, curious, well-mannered and glowing reflection on the results this organization gets. Indeed, several of the kids I spoke too had been accepted into college programs which is saying a lot given the circumstances they were born into. I also met the young woman that I personally sponsor and I felt very proud of her accomplishments and to be personally involved in her ongoing success. Here, you can see me in a classroom with some of the Critical Thinking teens. I was speaking to them about success, my life experience and trying to make a real authentic human connection with them. I found they were open and engaged me at a deep level asking thoughtful questions and offering their own opinions freely. 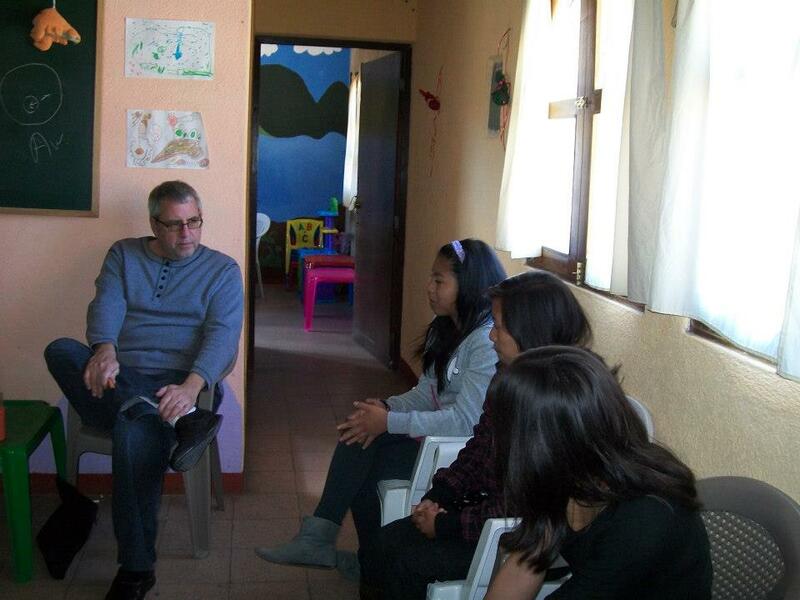 I must say that while visiting Guatemala, I learned as much from these kids as perhaps they learned from me. In fact, at times I felt humbled by their warmth, presence and attitude of gratefulness that they had. They were clean, well-groomed and not just for this one day. In general, I found the people in most of these villages very conscientious to details of outward appearance, not in a bad way, but in the sense of taking pride in themselves. This surprised me given some of their living conditions. Here, indoor fires are common and many of the children have respiratory problems at a young age. You will note that the walls of this dwelling our corn stalks. This is fairly common, but you will also see some buildings made out of stone blocks or adobe. 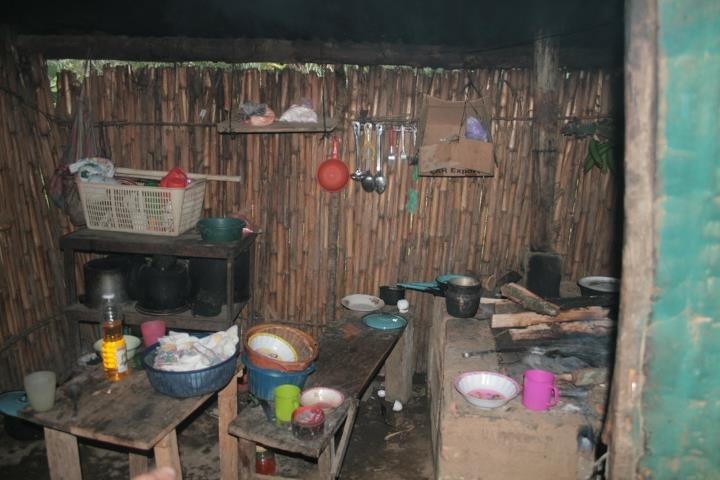 In one village, the people were living in a setup like this and the one building they had was used for supplies and food. In other words, they put keeping these things safe above their own comfort and lived next to and around the supplies. I feel a social responsibility to spread the word about this organization and to participate in their work to the degree I can. As I said above, I am also a sponsor and I encourage others to get involved. Unfortunately, to some extent it is U.S. intervention in Guatemala that has contributed to the social inequity here and our habit to demand cheap coffee without thinking of the potential consequences on the people who grow it. So, if nothing else, please be a conscious consumer and consider buying shade-grown, free trade, organic coffee. If you want to do more or meet Deb and Mick, they will be coming to the Northern and Southern California next week to talk about their work. If you can make it to this event and/or spread the word that would help. You can sponsor a kindergarten student for a month for as little as $35/month and this includes some nutritious meals. That’s not a big sacrifice for many people to touch a life in such a deep and long-lasting way. I mentioned above that Guatemala is physically beautiful. You can find many examples of that on the Internet. However, I thought I would leave you with a picture of me near Lake Attitlan. The poncho I’m wearing was actually a necessity because the morning at lower altitudes was uncomfortably cold and damp. 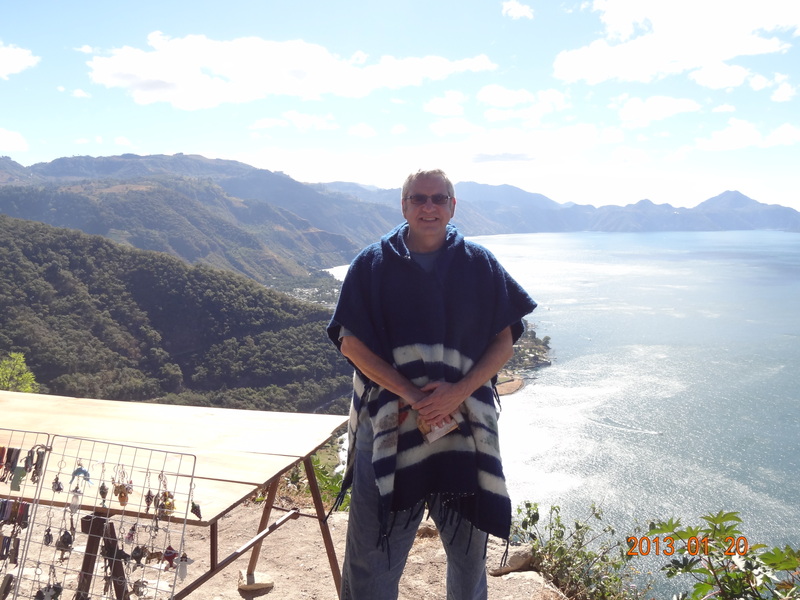 I don’t know how well I fit in with the other tourists, but that handmade wool poncho felt like a heating pad. I brought it back with me as a memory of Guatemala – a soulful place with equally soulful people who I will always hold in my heart with great fondness and respect.